I am not sure why I want to share my pastel “Bell Pepper with Scar” on my first post of 2012. I wanted something visual for sure as I have not posted an image for months. 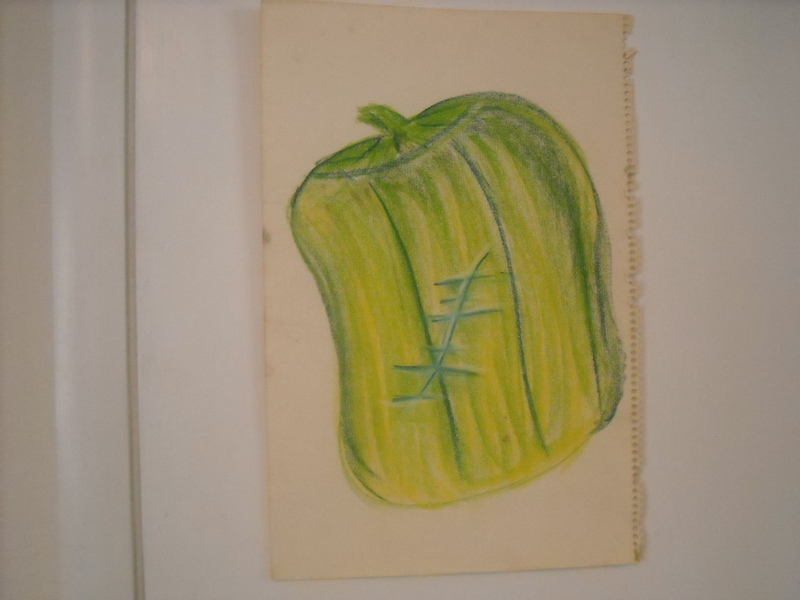 But it also has to do with the oddness of the picture–a scar on a bell pepper! A strange harmony draws me to this piece, what with the pepper slanting one way and the scar the opposite. I completed the pastel years ago at a time when I was writing the final chapters of my memoir manuscript about my infant surgery. One day, while harvesting peppers from my garden, the image came to me. At the time, I thought the pastel communicated that as a baby, my body was a perfect vegetable made imperfect by the scar. But the picture won’t let me settle for this interpretation. The scar makes the pepper interesting. Without it, it is just a bell pepper. I’m back. I thought about it for a minute. The pepper is a metaphor for people. None of us would be interesting if we didn’t have some battle scars. Maybe some people aren’t interesting because they have too many scars, but it seems to me, they are the exceptions. If we were perfect, we would be bland. I’ve only had a couple of psychology classes so I base this on personal observation. I hope you keep the pepper posted. Thank you for this insight. My scar makes me all the more human. I am lovable, in part, because of my scar! It’s an intriguing, beautiful and poignant image. Love it! So glad you like it! I’m finding more and more to like about this pastel. I love that cheeky bell pepper as a playful, cheeky, chirpy bit of self-expression, and for all the significance you and “highdesertblue” have attached to it. So good! “That cheeky bell pepper” kind of goes with your latest SIS blog post about scars, scar artists, and creativity, doesn’t it? Scar art! Ah! I’ve wondered whether that series prompted you! Our body is like a vegetable. We, human, are sometimes born with birthmarks and have scares from a very young age. Vegetables are the sames, some grow abnormal with marks, and tends to have scares and open flesh on our their body. Our human body as well. I like the comparison! I like your discussion of the similarities between vegetables and human bodies. Thanks! Time is the best healer. Most times, yes. But sometimes, conditions worsen with time, like depression, because we simply don’t know how to cope. We All have scars on one way or other; I love it. Yes. In a way, scars make us human. I didn’t always feel this way, however. How I wish I had known this as a young girl. on March 5, 2012 at 7:41 pm | Reply alicia c.
Sometimes it makes us feel less like a victim. When we use metaphors. It makes us feel more like a survior. And by talking about it we find that we are someone’s hero. Who may not have had the courage to speak? And by hearing it they might can now speak and change a persons life like you did. Or better their own life. Fabulous! I love what you said about metaphors and their power to turn someone from a victim to a survivor. So insightful.